Log Cabin quilt top made from all Kaffe Fassett fabrics with fussy cut flower center blocks. It is 64.5" x 97". 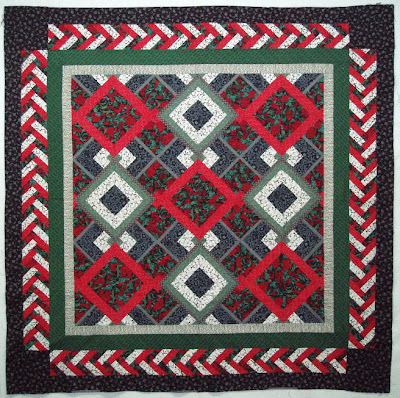 This all batik log cabin quilt top has a large variety of fabrics in it. It is 45.5" x 63.5". The logs are 1" wide. It would look good with 2 borders, a narrow and a wide one or finish it as is. There is a row of staystitching around the perimeter of the quilt. This photo shows 24 of the 28 blocks that are available. The photo below shows a closer view and a little better representation of the true colors. This group includes 28 pieced 11.5" blocks and 2 1/8 yards of the fabric shown at left. You could easily fill in with plain 11.5" squares cut from the fabric to make a larger quilt. quilt top 50" square, ready to be finished with quilting and binding. All batik fabrics. The squares and triangles in the design are 2". Blazing Star quilt top 58" x 76", ready to be quilted and finished. All batik fabric. This is a quilt top only (not a finished quilt). It is approximately 32" square and has 256 little squares in it. The gray is the design wall flannel, not a border. Click on the photo to enlarge. This is a quilt top (not a finished quilt) and it measures 28" x 35" and has 300 little squares to make the colorwash design. Click on the photo to enlarge it. This strip pieced Kaleidoscope quilt TOP is 73" square. 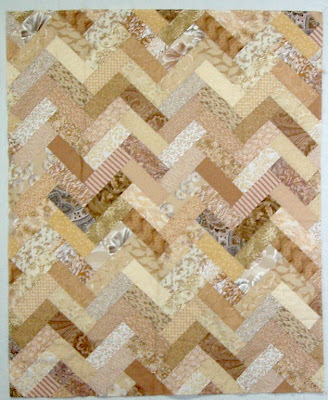 Several groups of 5 fabrics from light to dark were pieced into stratas, cut into triangles, and then 2 different stratas were used in each block. This quilt leans from periwinkle to true blue to aqua/turquoise. The outside border is an very dark inky blue with roses in a lighter shade of blue. I have made a large series of Prismatic Garden quilts. That is my original title for my series, not a pattern from anyone else. I sew stratas of 4 fabrics, cut triangles, sew 4 together to make blocks and play with them on the design wall. Sometimes I design specific blocks to make the colors flow. This TOP is 40" square. This quilt TOP is 57" x 81". It is made of a large variety of batiks that were purchased over the last 5 years. Click on photo for a larger view. This is a close up of a few of the blocks and the setting triangle fabric. This is close to the true colors. I added a green strip top and bottom on the top after this photo was taken so it is bordered all around. It measures 40.25" x 50.75". quilt top 35.5" x 43.5"